If you ask any of my family and friends what my favourite food is, they'd say peanut butter. That's because I'm known as a peanut butter addict. 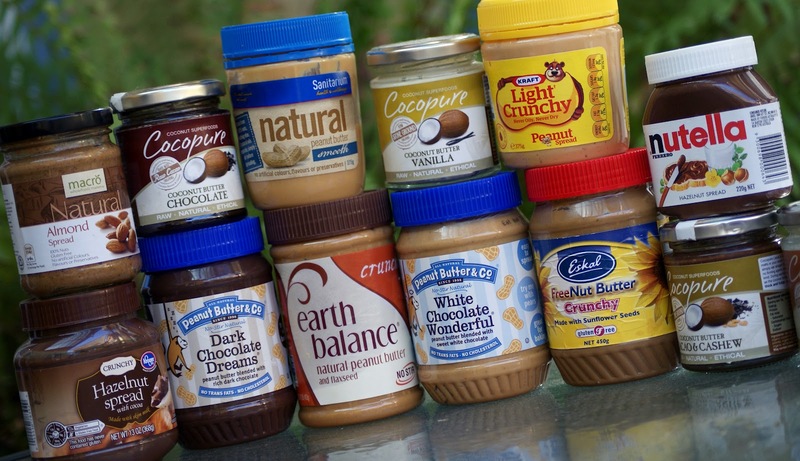 But it's not just peanut butter that I love, I'm a nut butter addict in general. There are quite a lot of staple nut butters (and other butters) I have in my house at all times - peanut butter (in at least 3 different varieties), almond butter, sunflower butter, nutella and coconut butter. I put nut butter on everything I can - muffins, cereal, oatmeal, overnight oats, muffin messes, sweet potatoes (almond butter and cottage cheese are my favourite sweet tater toppings! - my family thinks this is disgusting). If I put nut butter on anything, I will always leave a big dollop for the last bite. This means when I top my breakfasts with it, I always leave some in the side dish I melted it in for the last bite. Sanitarium Natural Peanut Butter- I always change between the crunchy and smooth with this PB, at the moment it's smooth. It only has 1 ingredient, 100% peanuts and is super drippy and delicious. This is a great PB to use in recipes because you don't need to melt it. Kraft Crunchy Peanut Butter- My childhood favourite PB still has a large place in my heart. I don't care if it has added oils or sugars, it tastes delicious! It's more solid than the natural PB so when drizzling it over something I melt it for about 40 seconds first to get it drizzle-worthy. Dark Chocolate Dreams Peanut Butter - I bought this off iHerb and was actually surprised to find I didn't like it as much as I thought I would. The jar has had a far longer life span than most in my presence as I don't use it alot, but I do like it as a faux-frosting on muffins. 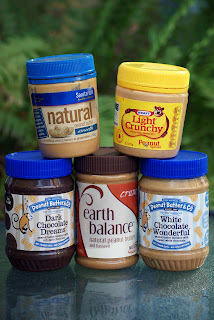 Earth Balance Crunchy Peanut Butter - This peanut butter is one of my iHerb staples. This is my favourite PB for Sandwiches and I am desperate to get my hands on the new crunchy coconut peanut butter as they didn't have it in Louisiana. This PB also has flaxseeds, giving you an omega-3 boost! White Chocolate Wonderful Peanut Butter - another iHerb buy. I like this one better than the dark chocolate dreams but as it's a really sweet PB I don't use it as much as the others. It also makes a great faux-frosting and is perfect when added to baked goods or not-so-sweet breakfasts. I love how it tastes frozen and will often freeze some to eat on it's own or spread it onto a banana and freeze it for a treat later on. Coconut Butter is another one of my favourite spreads. At the moment I have a full collection of Cacao and Cashew, Coconut Cashew, Vanilla Coconut and Chocolate Coconut Butters - though plain coconut butter and vanilla coconut butter are my hands down favourites. I love drizzling a bit over cereal, oatmeal or other breakfasts and they're great in sweet recipes too! Currently both vanilla and plain coconut butters are on my to buy list as the jars are empty! I'm not only partial to peanut butter, other butters get loving too! 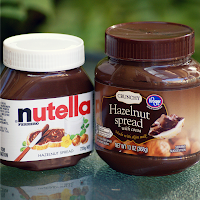 I have always been a fan of Nutella every now and again and things haven't changed! Nutella also makes a great faux-frosting and is a delicious treat to have on a sandwich or on top of oatmeal, cereal or other breakfasts. I love nutella and bananas together and one of my favourite nutella combinations is a little odd but so delicious - nutella and plain goats cheese. It sounds disgusting but it works, trust me! Whilst in Louisiana I spotted Crunchy Hazelnut Spread from Kroger and of course I had to buy it! I'm a crunchy nut butter girl so this is heaaaaaaaaaaaven! 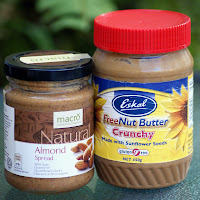 Almond Butter is my second favourite to peanut butter and jars suddenly drain all the time - not sure what happens there? I love almond butter on almost everything - carrots, apples, bananas, oatmeal, cereal, overnight oats, muffins bowls, sweet potatoes, sandwiches you name it! The one I currently buy from Woolworths under their Macro brand is made with 100% almonds and is delicious! Sunflower Seed Butter (Eskal call it Free Nut Butter) is also another butter I keep in my house. I love dates with sunflower butter and it's great on sandwiches. I wish I could find an unsweetened version, though! Sunflower butter is another thing that tastes amazing on sweet potatoes and before I realised soy was a major problem for me, I used to love mixing a little sunflower butter and soy sauce for a stir fry sauce - delicious! So tell me, are you a nut butter fan? Teehee, I could have written this post! Except, alas, my current stash is all but gone (I only have black sesame spread, peanut butter, and cashew butter left) as I head off to America next week. At which point I'll be hunting down Naturally Nutty flavours, squeee! Fellow nut butter addicts unite. Black sesame spread sounds really interesting! Cashew spread is good too! I've only ever made it myself before, but noticed Woolworth's Macro make one so I may have to pick up a jar! Enjoy your trip to America! I want to try Naturally Nutty but unfortunately Louisiana is lacking in nut butter choices :P Perhaps I need to get some shipped to Jesse! I have the same almond butter! Yummy. I love it!! Did you know that if you turn the jar upside down when you first buy it, it will mix through the oil so that you don't have to stir so much when you open it? I have the cashew butter too, but I've yet to open it!